I am privileged, I have a disabled bus pass - at the moment I am allowed to travel on buses in Barnsley (and the rest of South Yorkshire) all day, every day at any time I want. In a few weeks that will stop and I, along with other disabled people and pensioners will only be able to travel from 9:30am until 11pm. The passes currently enable us to travel on trains within South Yorkshire and as far as Leeds in West Yorkshire provided we don't break the journey in West Yorkshire - that will be stopping too. This may not sound too bad to you - after all it apparently bring us into line with the rest of the country according to the Travel South Yorkshire website. But does it? A bit of Googling showed me fairly quickly that if you live in the West Midlands you can use your pass on trains, that in Bristol you can travel on buses from 9am, and that in Manchester you can travel on trains and trams for free from 9:30am and for half fare before that time. There does not appear to be a national standard for the additional benefits these passes give local residents, it all depends on the local councils' funding. 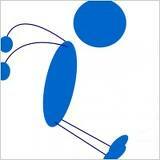 And what about the impact on disabled people who work? - whereas now we can take a job (or a voluntary role) that requires us to start work before 10am in a few weeks we will have to pay full fare to get to work on time. We might only work part-time or for nothing ... finding £4 a day bus fares out of nothing is not very easy! Basically Barnsley are having to save some money ... and pensioners and disabled people are going to feel the pinch. I have no income, apart from a little generated by giving history talks, which to be honest doesn't cover my expenses, petrol, stationery, and books. 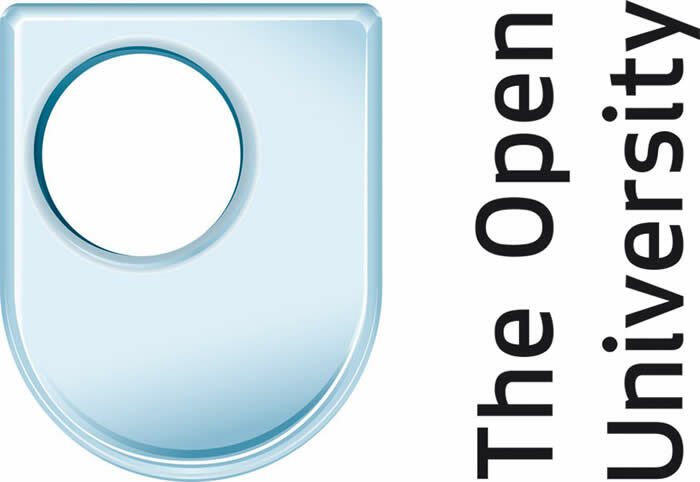 I am lucky that the OH is happy for me to study with the Open University and that my mum has been so generous in paying my fees these last two years. From 31 March if I want to be somewhere other than my home village before 10am, given that I live a good four miles from Barnsley town centre, I will have to pay a full fare. This will prevent me from attending any Open University tutorials in Leeds, which I used to travel to on the train - there is a bus alternative, but it would take two hours each way. I am not physically able to undertake a long bus ride like that, even a shortish hop around Barnsley wears me out especially as these days buses don't run services that cover areas like they used to. An example ... yesterday I went to Darfield to take photos of the war related memorials in the church. 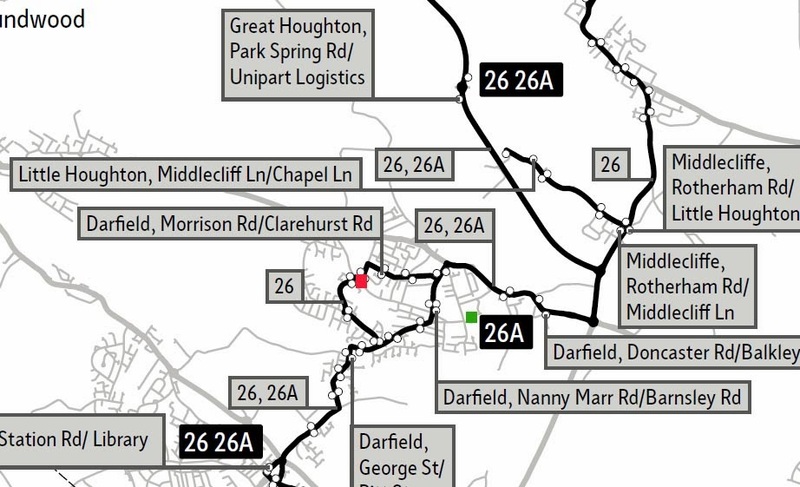 From Cudworth to Darfield there is a bus that runs once an hour, the number 26. According to the timetable it takes 42 minutes to get to Darfield from here. Google maps says it is 4 miles and in a car it would take 9 minutes, so why does the bus take so long? Because it services several small villages between here and there, that's why. I had a wonderful tour of Shafton, Grimethorpe, Middlecliffe, Great Houghton, Little Houghton and the estates of Darfield. I began to worry that something had gone wrong when I could no longer see Darfield Church, which is set quite high up and which the bus appeared to have circled without getting any closer. Asking the driver was no help, "What church?" he said. Two ladies on the bus commented that I'd better get off soon or I'd be in Wombwell - so I did. It felt like a mile walk back to the church, but at least it was on the flat. Googling it just now I see it was only 0.7 of a mile - but I don't walk much anymore without the OH to lean on so it took me 25 minutes. By the time I got to a cross roads, still not able to see the church, I was panicking so much thinking I was going to be late for my meeting and feeling very lost that a man I stopped to ask directions must have thought I was some kind of mad woman. He certainly walked off very quickly after telling me that there was no other church than the one by which we were stood, an obviously converted school building that is now a Methodist Church. The map above comes from the number 26 timetable (downloaded last week from the Travel South Yorkshire website. My problem was that the bus came into Darfield from Middlecliffe, having already meandered around Great and Little Houghton, from the east, went over the river and up the hill and onto Nanny Marr Road, at which point it immediately plunged into the estates, following the loop labelled 26 and Morrison Rd/Clarehurst Rd on the map. The church is at the green square, the bus gets nowhere near it during the day - in the evening the 26A get a lot nearer, it would only have been a 0.2 mile walk for me from that bus stop labelled Nanny Marr Rd/Barnsley Rd. I eventually got off the bus at the red square - near a Co-op shop which my contacts in Darfield called the "Old Longbow" so I assume it is a converted pub (shame!). The ladies on the bus had also suggested I should have got off the bus at the bottom of the hill and "walked up the lane", I just checked this on Google maps too - that would have been a 0.4 mile walk and all uphill from the point labelled 26,26A on the road before the turn on to Nanny Marr Road, so probably a worse option for me that the 0.7 on the flat I did do. As a consequence of this adventure by the time I reached the church and met SM and KV I was very tired, stressed and still quite panicky. Fortunately they had waited and appeared to be pleasantly passing the time of day with some volunteer gardeners - part of the Friends of Darfield Churchyard I assume. 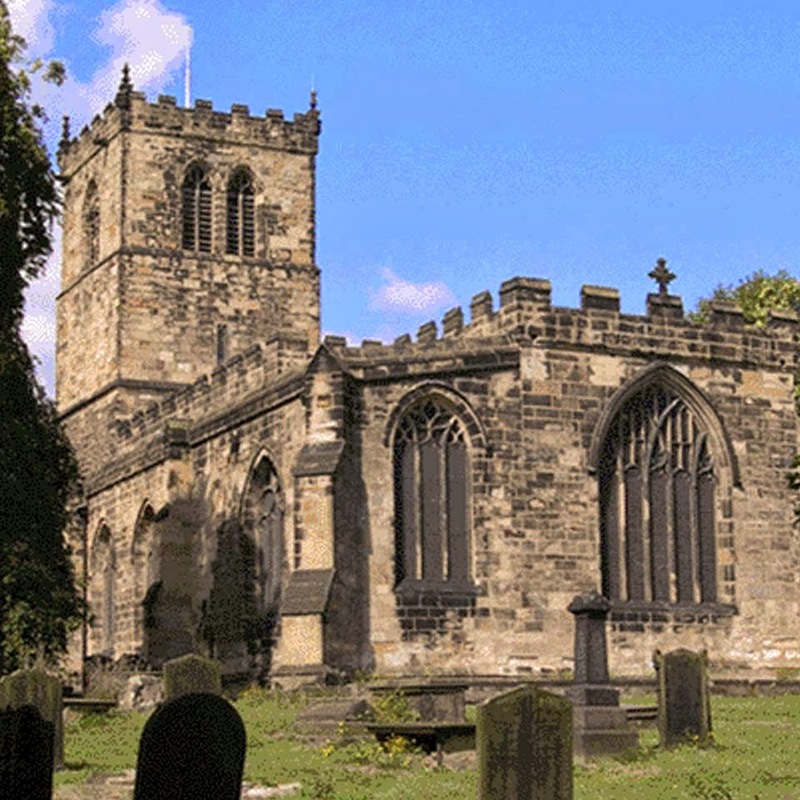 The church has a very good website, which includes the Friends of Darfield Churchyard's newsletters and indices to the burials in the churchyard as well as lots of other information. My contact was through FODC members SM who had attended a Barnsley War Memorials Project meeting a few weeks ago and KV whom I had previously met through the Barnsley Family History Society. They showed me around the church for quite some time and it was fascinating and very interesting. I even saw a dragon! I will be posting my war memorial photos on the Barnsley War Memorials site over the next few days so keep an eye on Twitter (@BnslyWarMems) or our Facebook page for updates, but here's a picture that doesn't quite fit the category but is too interesting to miss off an account of my visit. 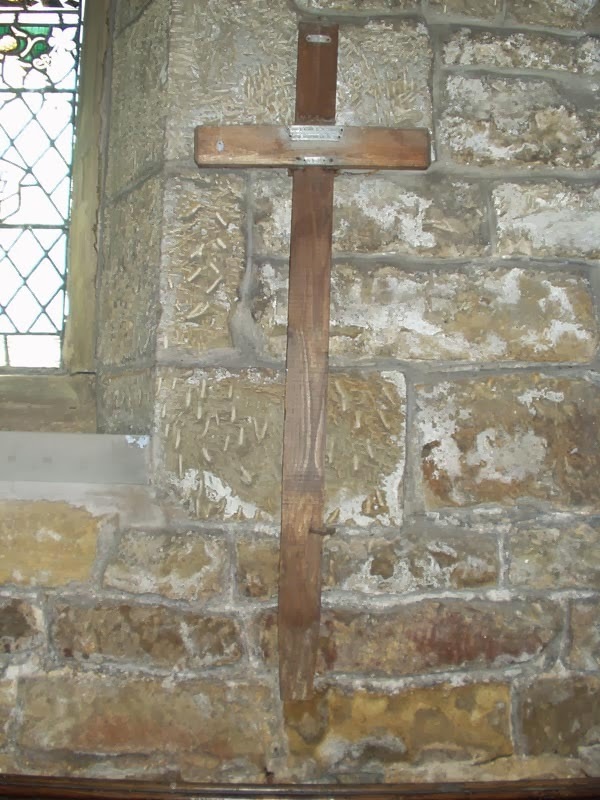 The picture to the right shows a wooden cross, the original cross that marked the grave of Charles, the son of the Rector of Darfield from 1892 to 1934, the Reverend Albert Ernest Sorby. This is the actual cross that stood on Charles Malin Clifton Sorby's grave 14 km south-west of Ypres before it was replaced with the standard Commonwealth War Graves Commission stone. It bears little stamped metal labels which read: "2nd Lieut C M Sorby 3rd Monmouth Regt 8-5-15". Nearby is a brass plaque telling visitors that the window adjacent is dedicated to Charles and was given to the church by his parents. I appear to have neglected to take a photo of the window, which is a shame - but maybe KV can help me out as she did say she had photos of most of the church. I went home on the X19, the fast bus on the main road which runs from Doncaster to Barnsley, and then on one of the usual Barnsley to Cudworth services. It took another hour or so, with some stoppages in traffic as we approached the town centre. In all I was out of the house for just three hours. But I was exhausted and I still had to attend the Friends of the Archives talk that evening ... needless to say I got up late today, and I am having trouble concentrating on things. I can still manage the 'stream of consciousness' that is my style of blogging though! Maybe that's why you haven't had much from me recently - I need to be ill or very tired to blog! If I'm feeling OK there are more important things I have to be getting on with! Thanks for reading and please follow the progress of the Barnsley War Memorials Project via Twitter or Facebook or directly on our blog/website. We started with 74 war memorials in the Barnsley MBC area and have now found more than 150 with more being added on a regular basis. If you want to find out where your Barnsley ancestor or relative is remembered try a search of our site! You might not find him/her today, but he could very well be added to our lists next week!